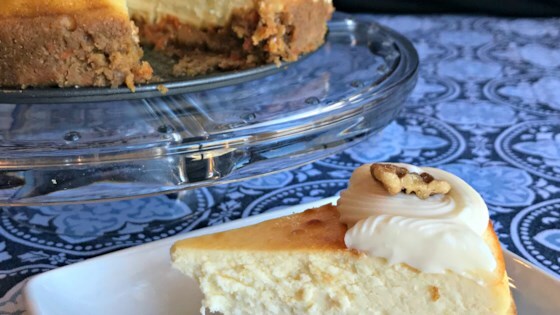 "A great carrot cake and a traditional cheesecake all in one bite." Position the oven racks in the center and lower third of the oven. Preheat oven to 350 degrees F (175 degrees C). Fill a roasting pan halfway with water and place in the lower rack in the oven. Spray the inside of a 9-inch springform pan with cooking spray. Beat three 8-ounce packages cream cheese in a bowl using an electric mixer on high speed until fluffy; reduce speed to medium-low. Add white sugar and beat 2 minutes. Beat 4 eggs, 1 at a time, into cream cheese mixture, beating well before adding the next egg. Beat sour cream and vanilla extract into cream cheese mixture until smooth; add 3 tablespoons flour and beat until cheesecake mixture is smooth. Beat brown sugar and canola oil together in a separate bowl using an electric mixer on medium speed until smooth. Add 1 egg and beat for 2 minutes; reduce speed to low. Add 1 cup flour, cinnamon, baking powder, and salt and beat until batter is combined. Fold carrots and walnuts into batter. Spread carrot cake batter in the prepared pan; top with cheesecake mixture. Place pan on the rack above the roasting pan with water in the oven. Bake in the preheated oven until cheesecake is set, about 1 hour 10 minutes, covering top of pan with aluminum foil if browning too quickly. Cool for 10 minutes. Run a knife around the edge of pan to loosen cake; cool to room temperature in pan on a wire rack. Refrigerate at least 8 hours. Remove the outside of the springform pan. Beat confectioners' sugar, 4 ounces cream cheese, and almond extract together in a bowl using an electric mixer until frosting is smooth. Spread frosting on top of cheesecake layer. Food coloring can be added to the frosting, if desired. Top frosting layer with coconut (with or without food coloring added) and/or chopped nuts. Had it for Thanksgiving. It was amazing! Didn't change a thing. Definitely a keeper as everyone wanted the recipe. Despite being in the oven for 1 h 25 min, the carrot cake was unbaked. I made no substitutions and followed the recipe prep exactly as provided. When we cut the cake, the carrot cake was still partially raw. The cheesecake part tasted great though. I cooked it the time suggested, didn't want it to overbrown. Not sure why it happened.